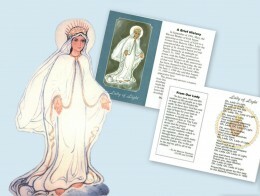 This special activity simply puts prayer cards of Our Lady of Light into the hands of interested parties. Since its inception, this program has placed tens of thousands of prayer cards in wallets, pockets, and purses in every state in the union and in a growing list of foreign countries. In response to the medal of Our Lady being made, I do not ask for this honor, but will accept it as it is offered, because it will call attention also to my Son Jesus, in His final hour of God’s triumph, being man’s redemption (The Pieta). I thank all involved in this endeavor, and if this comes about, I tell you now that the same graces attached to my prayer card will also be attached to this medal. It is a promise given and a promise kept. NOTE: This is a response to a question I was told to ask her about creating a medal of Our Lady of Light, which would also have a likeness of the Pieta on the back of it. Since May of 1997, over 1,000 packets of prayer cards and testimonials have been distributed throughout the United States and other countries by telephone and mail request. In America, orders from 49 states have been filled. Out of Country: Australia, Brazil, Canada, England, Italy, Israel, Jerusalem, Ireland, West Africa (Nigeria and Ghana), Saipan, Nova Scotia. In addition to the packets answering requests from the states and other countries outlined above, thousands more cards have been distributed at Our Lady of the Holy Spirit Center, especially on Our Lady of Light anniversary celebrations, Days of Prayer and Mercy on August 31st and September 1st each year.